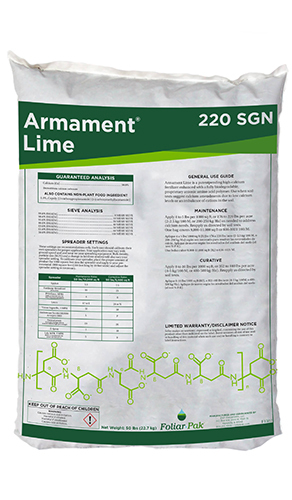 Armament Lime is a patent-pending, high-calcium fertilizer enhanced with a fully biodegradable, proprietary anionic amino acid polymer. Armament Lime features uniquely low application rates, a cleaner calcium particle, an increased uptake of calcium in the plant, and a quicker green-up of turf and ornamentals without excessive growth. Armament Lime’s proprietary and uniquely engineered amino-acid polymer was created specifically to be effective in increasing the solubility of calcium sources, and of other tied-up nutrients within the soil by creating soluble complexes with them via amino-acid carboxylic acid groups. 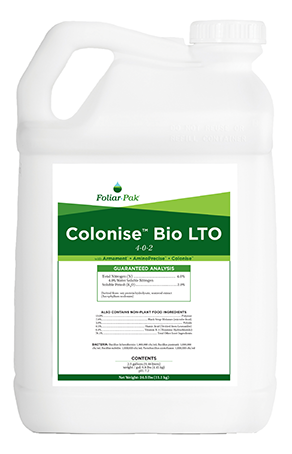 Armament technology is long lasting in the soil, with the polymer lasting up to 4 months in many soil types. This allows for longer-lasting uptake efficiencies for calcium and other nutrients.